Contemplate the worst scenario that might confront a pilot during a flight. What comes to mind? Fire? Flight control failure? Engine failure? Perhaps it’s flight crew incapacitation, explosive decompression or severe structural damage. No doubt about it, those all fall into the Very Bad Day category. But there’s one that can be even worse: a mid-air collision. That’s because it can involve all the problems listed above — at the same time. And since the parties involved aren’t aware of the impending crunch until it’s too late, the mid-air is usually accompanied by a violent element of surprise, confusion, and initial denial. You might think fatal mid-airs are rare events, and from a purely statistical standpoint I’d have to agree. According to the 2010 Nall Report, a fatal mid-air occurs about once every 8 million flight hours. Think of it as the roughly the same odds as winning the lottery or being struck by lighting. Doesn’t sound so bad, does it? A typical GA pilot might accumulate but thousand or so hours over a full lifetime of flying. So what’s there to worry about? Plenty. The “big sky” theory may sound good, but it doesn’t hold up very well under close scrutiny. It’s true that the navigable atmosphere over the United States alone is massive — about 20 million cubic miles — and there are relatively few airplanes in the sky. Even on those occasions where a collision is possible, modern tools such as radar, TCAS, VHF communication, and anywhere between two and four sets of eyeballs almost always succeed in averting the disaster. If aircraft were equally distributed throughout the atmosphere, the “big sky” idea would be pretty comforting. But airplanes cluster near airports, large cities, and on thin slices of the sky known as “airways”. For the VFR types, airspace and terrain often crowd planes into small swaths of the air in places like the Santa Ana Canyon or Banning Pass. The sky is much like the ground: vehicles stick to relatively confined spaces and that makes collisions a serious hazard. Mid-airs are nothing new. 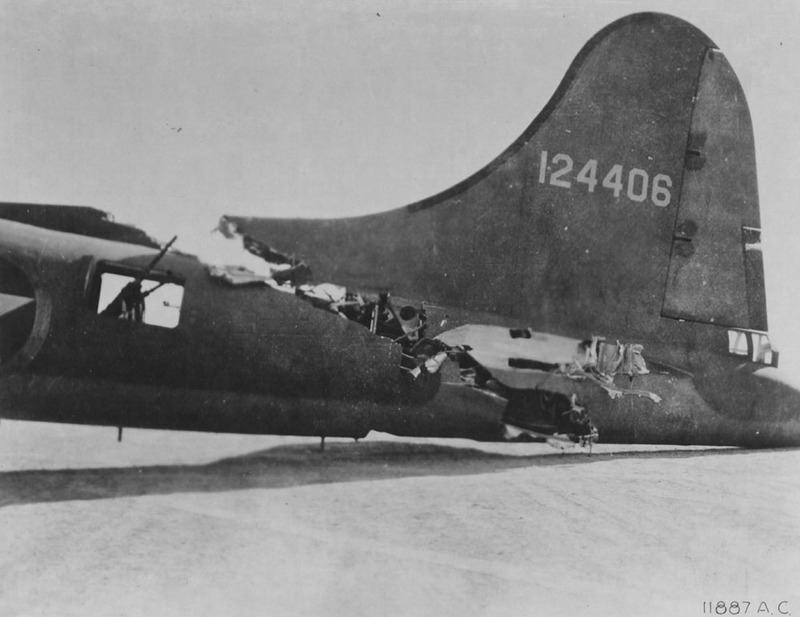 This B-17 collided with a German fighter over Tunisia in 1943. Since we’re on the topic of statistics, let me give you a few of my own: I personally know two people who have been struck by lightning, and a winning lottery ticket was recently sold not 300 feet from my front door. Hey, crazy stuff happens. But unlike lighting strikes and golden tickets, we’re not all facing the same odds. The risk profile varies widely depending on the type of flying you’re doing. For example, flight instruction is frequently a factor; thirty-seven percent of mid-airs occur with a CFI on board. Many instructional flights happen near airports, and as previously mentioned, that’s where other airplanes tend to congregate. On the other hand, if you fly airliners, your risk of a mid-air is rather low because the aircraft itself is large and easy to see, you’re always flying IFR, and the most sophisticated traffic avoidance hardware available is always installed. Airliners also spend most of their time in cruise and are in constant radar contact with ATC. Think it can’t happen to you? Think again. Some very talented, capable, and well-respected pilots have been involved in mid-air collisions. I know a guy who was involved in one while flying a large-cabin, TCAS-equipped business jet under Instrument Flight Rules. Alan Klapmeier, the founder of Cirrus Aircraft, was in one too. Richard Collins, famed Flying columnist, was in a mid-air. Speaking of Flying, the current Editor-in-Chief owns a very nice Cirrus SR-22 which was recently in a mid-air. And lastly, a decade ago I was in a mid-air collision myself. I’ll save the blow-by-blow (no pun intended) on that for another day. The point I’m trying to make is that the odds of a mid-air are probably greater than you think, especially if you live in a populated metropolitan area and fly VFR. If you’ve ever had a close encounter with another airplane in flight, you were only separated from “those who have” by nothing more than a miniscule sliver of plain old luck. This may be hard to believe, but there is some good news. For one thing, mid-airs are not always fatal. It seems intuitive that most collisions would involve fatalities, but all the people I cited above survived, including (obviously) myself. Also, technology is rapidly advancing, from cheap TCAD boxes to airframe parachutes to super-bright LED exterior lighting. It can happen anywhere. 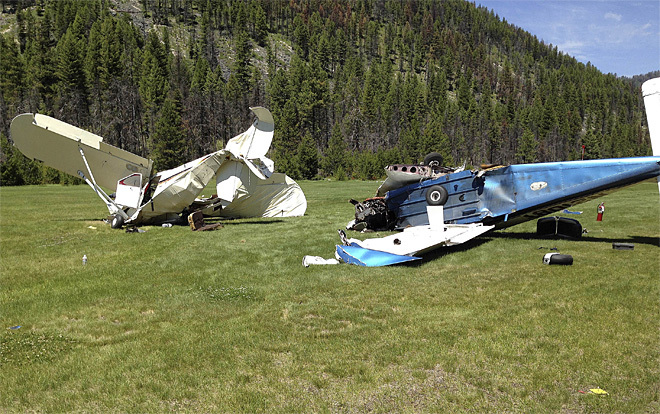 These two aircraft, an Arrow and a TriPacer, collided in Idaho recently. The “See and Avoid” concept relies on knowledge of the limitations of the human eye, and the use of proper visual scanning techniques to help compensate for these limitations. The importance of, and the proper techniques for, visual scanning should be taught to a student pilot at the very beginning of flight training. effective strategy for collision avoidance. Other FAA publications, ranging from the Aeronautical Information Manual, to Advisory Circulars like AC-90-48 (“Pilot’s Role in Collision Avoidance”) will give you the same spiel: “see and avoid will keep you safe”. And it will! Until it doesn’t. From my perspective as someone who’s been in a mid-air and who was using proper clearing and scanning techniques at the time, I take it as gospel that “see & avoid” won’t always do the trick. I’m just one guy, of course. But many others — some institutional in nature — just happen to agree with me. For example, Canada’s Transportation Safety Board recently issued an accident report on a mid-air collision between a Beech V-35B Bonanza and a PA-28 Cherokee over northern Virginia. Canada was tasked with performing the investigation because the pilots of the Bonanza were employees of the NTSB while the Cherokee was piloted by an employee of the FAA. I won’t keep you in suspense. The conclusion from the TSB was that the “see and avoid” concept was inadequate. They even quoted a 1991 report produced by the Australian Transport Safety Bureau which provides an overview of the major factors that limit the effectiveness of the see-and-avoid principle in preventing mid-air collisions, as well as a 2005 scientific study published in Aviation, Space, and Environmental Medicine which came to the same conclusions. Cockpit workload and other factors reduce the time that pilots spend in traffic scans, and even when pilots are looking out, there is no guarantee that other aircraft will be sighted. Visual scanning involves moving the eyes in order to bring successive areas of the visual field onto the small area of sharp vision in the center of the eye. The process is frequently unsystematic and may leave large areas of the field of view unsearched. A thorough, systematic search is not a solution as in most cases it would take an impractical amount of time. The physical limitations of the human eye are such that even the most careful search does not guarantee that traffic will be sighted. The human visual system is better at detecting moving targets than stationary targets, yet in most cases, an aircraft on a collision course appears as a stationary target in the pilot’s visual field. An approaching aircraft, in many cases, presents a very small visual angle until a short time before impact. Complex backgrounds such as ground features or clouds hamper the identification of aircraft via a visual effect known as ‘contour interaction’. This occurs when background contours interact with the form of the aircraft, producing a less distinct image. Even when an approaching aircraft has been sighted, there is no guarantee that evasive action will be successful. Because of its many limitations, the see-and-avoid concept should not be expected to fulfill a significant role in future air traffic systems. Transportation Safety Board of Canada aviation investigation report A06O0206 identified that there is a high risk of mid-air collisions in congested airspace when aircraft are not alerted to the presence of other aircraft and rely solely on the see‑and-avoid principle. There’s one more area of the TSB report which is worth of quotation. In it, they reference a British Royal Air Force study into mid-air collisions. If you’re keeping score, that’s the third sovereign agency to reach the conclusion that “see and avoid” is inadequate. Yet our own FAA, which oversees about 80% of the world’s aircraft and almost all of the high traffic density airspace, still officially proclaims that one can look out the window and see everything that needs to be seen. A British Royal Air Force study into mid-air collisions, which were deemed to be random, found that the probability of conflict is proportional to the square of the traffic density, and recommended avoiding altitude restrictions that concentrate traffic. Measures such as improving aircraft conspicuity, pilot scanning techniques, and pilot traffic awareness can reduce risks, but they do not overcome the underlying physiological limitations that create the residual risk associated with a see-and-avoid method. It’s obvious that “see and avoid” cannot, by itself, ensure our safety. If it could, there’d be no need for TCAS or most of our controlled airspace (both of which came about because of high-profile mid-air collisions, I might add!). I’m not necessarily in favor of mandating any additional equipment, airspace, or restrictions, especially on general aviation. But it’s clear that serious changes are needed in how collision avoidance is taught, especially as it concerns “see and avoid”. The concept has serious limitations which must be understood so the pilot-in-command can make educated decisions about how — or even if — they want to mitigate those risks. Unfortunately, we cannot turn back the hands of time. The fatal collision between the NTSB and FAA employee aircraft is now part of the past. Those involved will think about it almost every day for the rest of their lives. Want to guess how I know that? I sincerely hope our nation’s regulatory and safety organizations will finally learn the lesson of that sad day by officially acknowledging what we all know to be true: “see and avoid”, while a good start and certainly a vital part of collision avoidance, is simply not sufficient to ensure traffic separation. Another eye opening post. It is really scary how much the technology can also distract us from the critical process of eyes-outside scanning. I love my TCAS, and I love my GPS, but I’m always afraid I’m going to punch at it for a frequency lookup at just the wrong time. We all need to do our best to ‘set it and forget it’ as well, to maximise our view outside the cockpit, and include an up and back scan when in the pattern as well. Really have to wonder how those two planes at Johnson Creek could be so confused on their (theoretical) radio callouts that they missed eachother. If One had looked up, and/or the other looked down, you’d think they’d spot eachother. We’ll possibly never understand what happened that very sad day. We must all be diligent at preventing these types of accidents. Very true — glass panels, handheld GPS units, video cameras, and other devices have been shown to increase our “heads down” time in the cockpit, and that’s a bad thing. I’m a big proponent of using all available resources to avoid collisions. My eyes, passenger’s eyes, radar services, VHF radio, proper clearing techniques, and awareness of traffic “hot spots” (they exist in the air just as much as on the ground!). Hopefully ADS-B will add to the toolbox once it starts rolling out en mass. Great post Ron! This is one of those areas that “fate is indeed the hunter.” – If I may borrow those words from the great Earnst Gann? This is always something that’s on my mind. One thing that might help (at least around non-towered airports) is to REQUIRE everybody to have 2-way communication, regardless of whether their aircraft is equipped with an electrical system. (Handheld radios are relatively cheap.) There are too many good old boys who have primitive aircraft without electrics and who don’t think it’s necessary to talk on the radio and let others know where they are and what they are doing. I get a good mental picture of the traffic at my airport by listening to the radio as I’m approaching. I wouldn’t dream of entering that (uncontrolled) airspace without means of communication. Many people would agree with you, Jim. My only hesitation about requiring two-way radio communication would be the fact that it’d ground pilots with poor (or no) hearing. There are a surprising number of them out there, good people, and usually smart about their flying (going early, avoiding busy times, etc). Perhaps what we need is a rule (which one could argue we already have via 14 CFR 91.13) that requires pilots to use a radio at a non-towered field if they’ve got one. Believe it or not, there are folks out there with perfectly good radios who don’t use ’em. To my way of thinking, that’s worse than an antique with no electrical system. Thank you for pointing out that those of us that fly NORDO are not inherently unsafe. I fly an antique with a hand held but with unshielded ignition the radio function is poor. My big concern are those that refuse to fly a proper pattern, at least from downwind leg. So many announce on the radio “inbound for landing” and then fly a five mile finale or dive in from a high base leg, not looking for traffic and not giving any time for “see and avoid”. An early primary instructor of mine told me “Imagine your head as a ‘bobblehead toy’ and keep it moving. I don’t want to see your eyes anywhere inside the cockpit.” We were heading for a “training area” near here. That training area supported flight training for four, sometimes five, airports in the area, not including military fighter jets in the area. She taught me well. Always preplan your flights, even for local “joy ride” flights, and make sure to clear the area before changing directions, or altitudes. Pay attention to your surroundings, and senses, making sure to use all available information. Personally this is my area of greatest concern. Apart from my external scan, en route I use a PCAS and preflight all passengers to check for traffic, request radar cover from ATC where possible. But still I am uneasy and have been cut up in the pattern by aircraft with poor visibility and apparently not listening to position calls even when they have a radio. More than once I have landed rather than practice landings as I have felt that someone in the pattern was creating an unsafe environment. I think everyone’s experienced that at some point in their flying career. Sometimes it’s an honest mistake — we’re all human, after all — but just as often I hear individuals broadcasting the wrong information over the CTAF, calling their position from the south when they’re really west, or saying left traffic when they’re making right traffic. Poor situational awareness is a big problem. On the other hand, there’s nothing more elegant than a mix of biplanes, helicopters, turboprops, twins, etc. all working together in the pattern to create an aerial ballet of appropriate spacing. It can be done. I’m a VHF pilot, and regularly fly into the Daytona Beach Charlie, which due to Embry-Riddle is the most congested GA airspace outside of Airventure. I *always* have flight following. By the time I pass St. Augustine southbound and get with DAB, I *always* get traffic callouts. “”177Q, looking for traffic” I answer. Here’s another chilling fact for this discussion: at or below the humidity boundary layer, typically 4500 feet over Florida, and filtering for the calls I wouldn’t see because they are behind me, obscured by clouds etc., I would estimate that I am able to identify less than one of five such calls. See-and-avoid is absurd, as is operating in dense airspace without flight following, or an IFR clearance. You’re not alone. Even with two pilots in the cockpit, an ATC traffic call-out, and a TCAS display showing bearing and relative altitude, we often fail to visually acquire traffic! I began flying in 1956. But before that I was an Air Traffic Controller. Along the way I did some Flight Instruction. I spent much of my life as a Commercial Pilot and retired as an Airline Captain. At no time in my 50+ year career in aviation did anyone tell me that “See And Be Seen” works. I certainly wouldn’t say it either. Sorry, meant VFR, am also a radio guy, should proofread next time. Having a working transponder is at least as important as a radio to show one’s position on the more reasonably priced traffic avoidance devices. But being an attentive pilot, undistracted by conversation or “bright, new, shiny toys” who realizes the dangers in crowded areas, like pancake breakfasts at uncontrolled airports, is a tough left seat to fill as we all are fallibly human at one point or another, though we like to think it’s always the other guy who will do something stupid. I am a flihgt instructor for a major flight academy in the Phoenix area, some of the busiest airsopace for flight training in the country. Last November my flight school was involved in a midair collision with an aircraft from another local school Fortunately all survived. Our aircraft was equiped with PCAS, but personally I thought the thing was a piece of crap. The alerts that it gave were almost always off by several miles. I spent countless hours searching the skies for targets that it was reporting as threats, and never spotting the other aircraft. I finally took a PCAS unit onboard one of our aircraft equipped with ADS-B In and Out, as well as TIS. Over half of the PCAS alerts were false — nothing in the air for 8 to 10 miles away from me. Sorry — got off track there. Anyway, I saw a documentary a few years ago that agrees with the sentiment of this blog — See and Avoid is bullsh!t. Try this experiment. Tape a dime on a wall, then stand 40 feet away. Try to find the dime. That’s the angular profile of a typical training aircraft (PA-28 or C-172) from 1 mile. Re. radio communication position/intention reports …… a big pet peeve of mine is charter pilots clogging up CTAF frequencies at non-towered airports from 30 miles out wanting to know if their passengers rental car is there, catering service, etc. etc. etc. Some of these guys (professional pilots???) think nothing of making not one, but numerous calls like this to the FBO, 95% of which could easily until they’re on the ground. Basically all they’re doing is trying to impress their passengers…. at the cost of potential safety of others! This type of thing not only affects position reports, but also potentially emergency calls such as if someone lost an engine and was trying to make a quick MAYDAY call. FBO’s seem to let them get away with it too by responding and answering their non-essential calls, probably only because the FBO’s are scared of losing the landing/business. But at what potential cost???? Hi Mike, I’m a charter pilot, so I know exactly what you’re talking about. However, perhaps the solution is to have a separate Unicom frequency so that pilots and FBO can exchange information. The presence of a rental car or specific services for the aircraft may not seem very important, but in the charter biz is incredibly competitive and runs on first class service. Having said that, hopefully no pilot –charter or otherwise — would intentionally cause a safety issue at an airport. Perhaps they are too verbose or think there’s nobody else around. I’ve seen police and others get chatty on frequency as well. It’s something we all need to be aware of, myself included. I have never felt that see and avoid was the only thing the FAA advocated to help prevent mid air collisions.